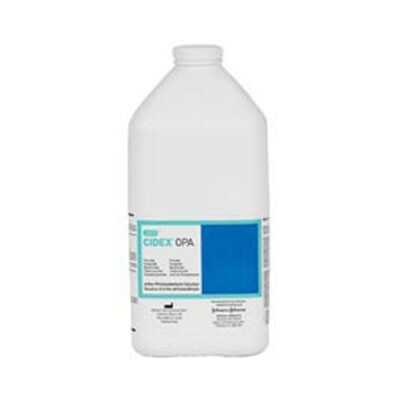 J & J ASP Cidex Opa Concentrate Solution is a high-level disinfectant (HLD) designed for use in the ASP Evotech Endoscope Cleaner and Reprocessor (ECR). A single shot safely delivers fresh HLD to each scope. Cidex Opa 20398 is a glutaraldehyde-free (0.55% ortho-phthalaldehyde) high-level disinfecting solution. Rapid 5-minute soak time at 25°C in an automated endoscope reprocessor. Twelve-minute soak time 20°C for manual reprocessing. No activating or mixing needed. Minimizes exposure to fumes, odor or irritation.